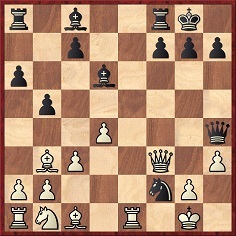 We offer some historical notes on the Marshall Gambit in the Ruy López (1 e4 e5 2 Nf3 Nc6 3 Bb5 a6 4 Ba4 Nf6 5 O-O Be7 6 Re1 b5 7 Bb3 O-O 8 c3 d5). 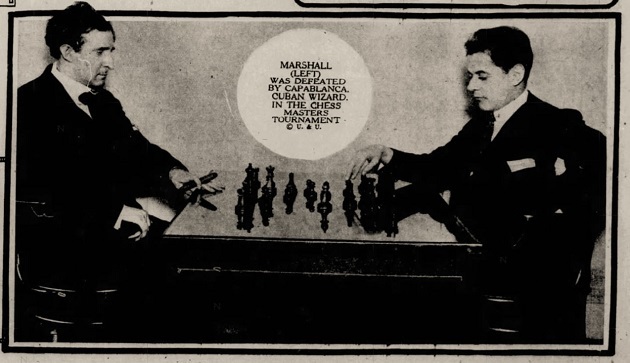 ‘Humiliated by the loss [his match defeat by Capablanca in 1909], Marshall diligently trained for some future encounter with the Cuban. 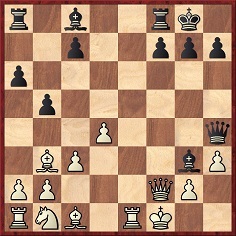 He developed a curious gambit that seemed to afford him splendid chances regardless of how Capablanca replied, and he practiced in private to keep his plan a secret. 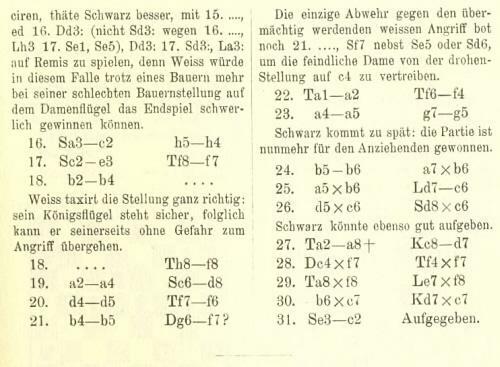 A further curiosity in Comparative Chess is that on page 104 it was 7…O-O, rather than 8…d5, that Marshall emphasized. Of 7…O-O he wrote (incorrectly), ‘This move of mine, I claim to be original’. We are aware of no ‘argument’ about the venue of the Walbrodt game, which was given in C.N. 1996 (see page 151 of Kings, Commoners and Knaves). He played the game in Havana on 18 or 19 February 1893 against four Cuban amateurs: Enrique Conill, Enrique Ostolaza, López and Herrera. 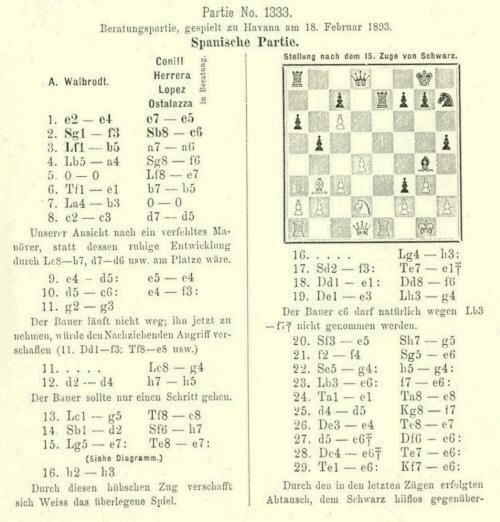 In another encounter involving the same players Walbrodt was Black. We believe that the German magazines’ spellings of the name Ostolaza were incorrect. 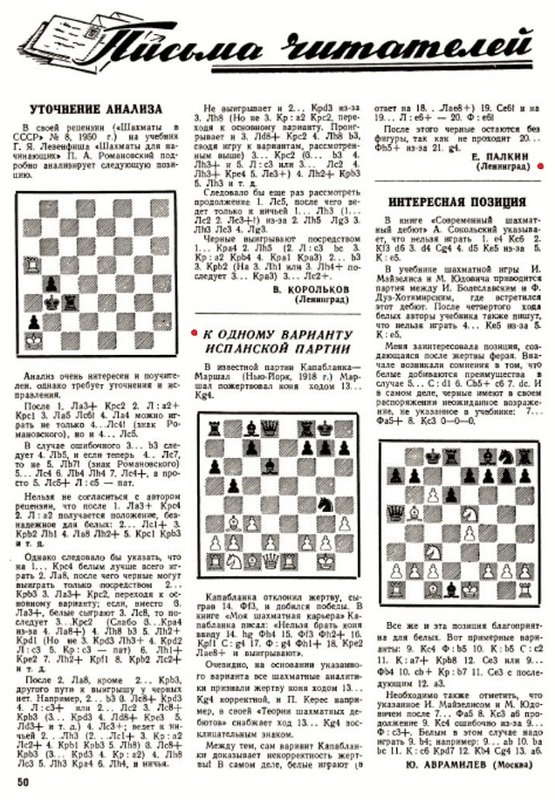 See page 23 of Ajedrez en Cuba by Carlos A. Palacio (Havana, 1960). 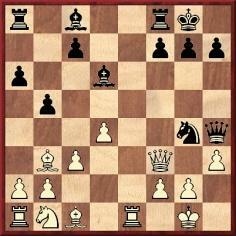 In My Chess Career, however, the Cuban made no mention of 15...h5. 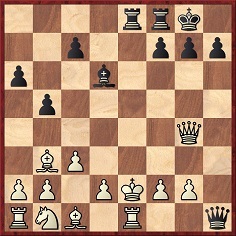 7...O-O: ‘Castling has been supposed to be undesirable at this point, on account of 8 Bd5. 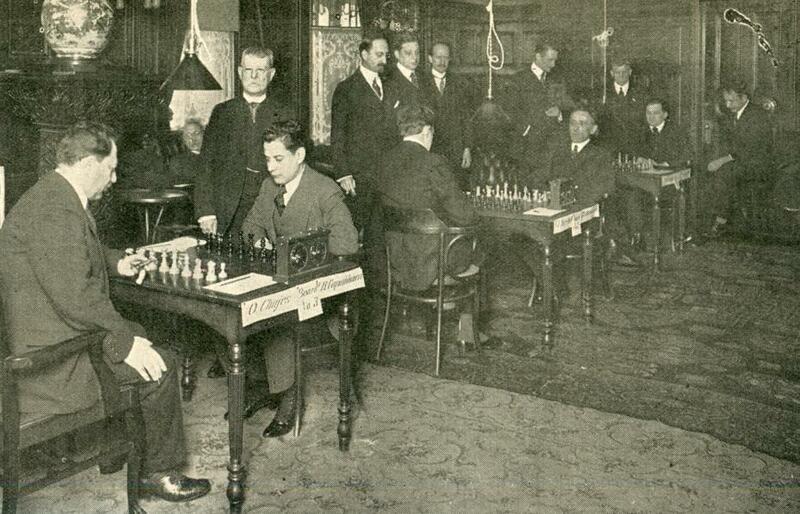 Below is the only photograph we recall from the New York, 1918 tournament, which was held at the Manhattan Chess Club. 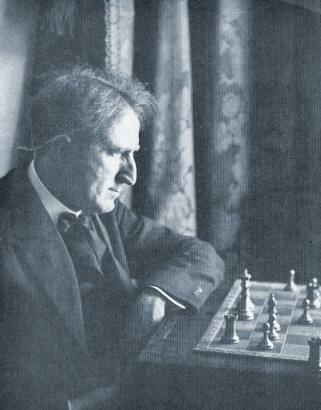 It appeared at the front of the tournament book and on page 252 of the December 1918 American Chess Bulletin. The caption quoted was in both sources. 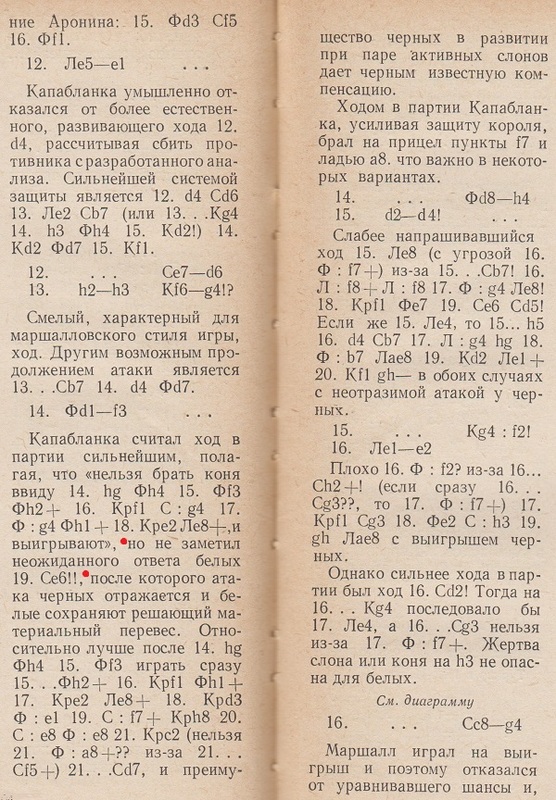 Regarding the involvement of Vassily/Basil Soldatenkov in the Marshall Gambit, see C.N. 6138. There followed Frere v Marshall, ‘New York, 1917’. Mr Soltis’ account being devoid of any sources, it can only be wondered on what specific grounds he stated that Marshall saw the Frere-Marshall game published in 1917. 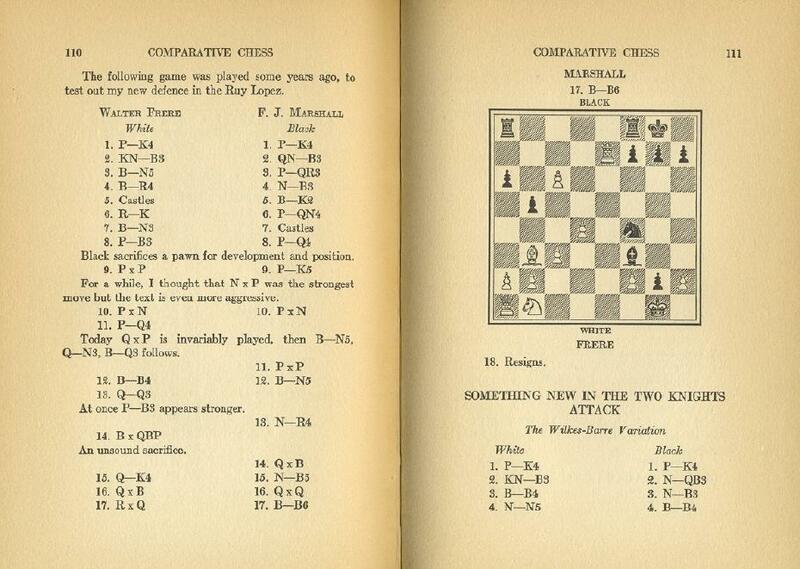 We have found the game nowhere prior to Marshall’s Comparative Chess (Philadelphia, 1932), a book which, moreover, gave the game datelessly. 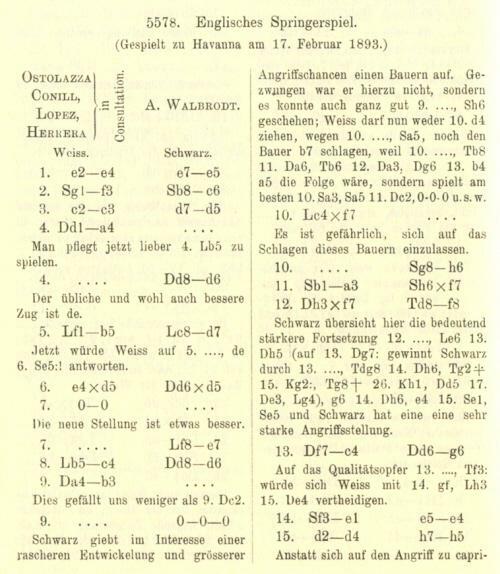 Bechert v Hagel, correspondence game, 1925 (Wiener Schachzeitung, October 1927, pages 306-307). 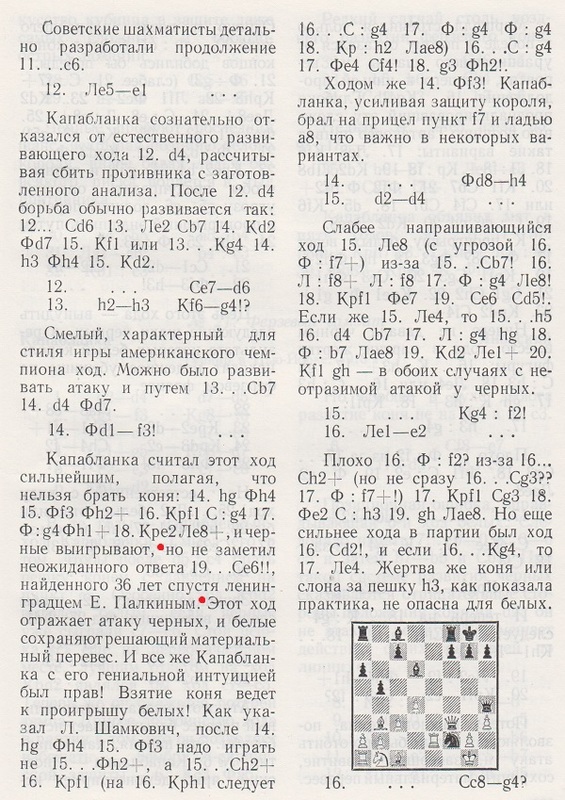 Page 21 of Modern Chess Preparation by V. Tukmakov (Alkmaar, 2012) follows Kasparov in erroneously ascribing the idea of 15... h5 to Shamkovich, whereas Capablanca himself had pointed it out. 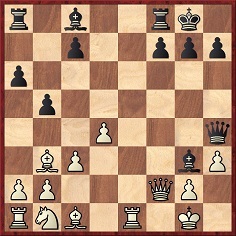 The present item discusses two analytical points in Capablanca v Marshall, New York, 1918 (which began 1 e4 e5 2 Nf3 Nc6 3 Bb5 a6 4 Ba4 Nf6 5 O-O Be7 6 Re1 b5 7 Bb3 O-O 8 c3 d5 9 exd5 Nxd5 10 Nxe5 Nxe5 11 Rxe5 Nf6 12 Re1 Bd6 13 h3 Ng4 14 Qf3 Qh4 15 d4 Nxf2 16 Re2 Bg4 17 hxg4 Bh2+ 18 Kf1 Bg3 19 Rxf2 Qh1+ 20 Ke2 Bxf2). Wanted: more information about the discovery of 19 Be6 by E. Palkin in the mid-1950s and, more generally, about Palkin himself. 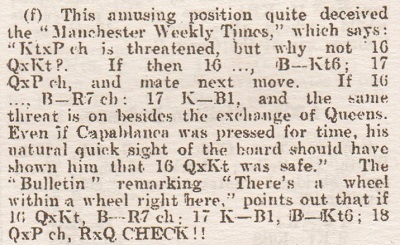 Does a reader have access to the Manchester Weekly Times (chess columnist: V.L. Wahltuch)? 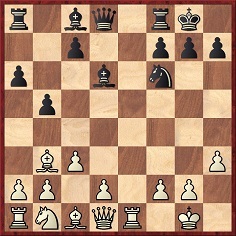 White does not play 18 Qxf7+. For further information about E. Palkin, see C.N. 10924. 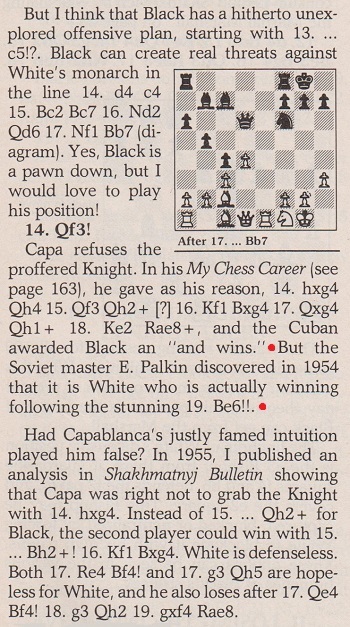 Olimpiu G. Urcan (Singapore) points out a ‘Myths & Legends’ article on pages 40-41 of CHESS, October 2018 in which Charles Higgie discusses Capablanca v Marshall, New York, 1918. 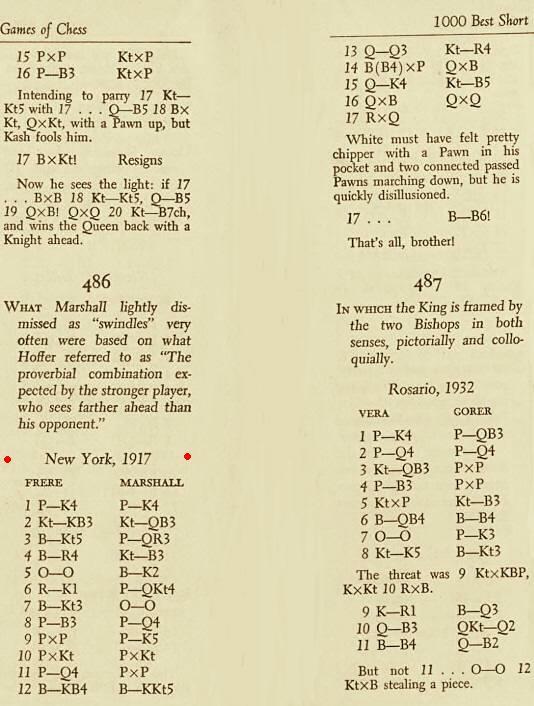 He lists three ‘myths’, and those 32 lines of text contain no facts not given in our feature article on the Marshall Gambit. There is even some verbatim copying, without a word of acknowledgement. ... between 1910 and 1918 the Cuban played 1 e4 against Marshall on six occasions. 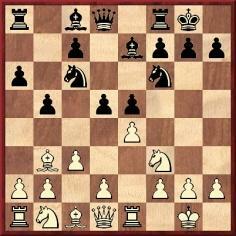 Five times the American responded with the Petroff Defence and once with the French Defence. 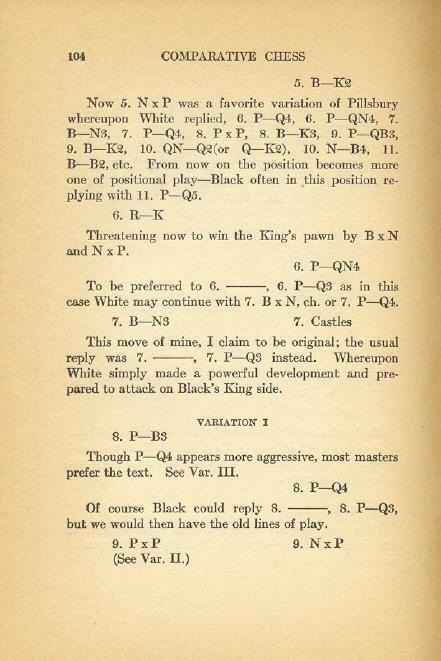 Marshall published the Frere game on pages 110-111 of his rarely-seen book Comparative Chess (Philadelphia, 1932). 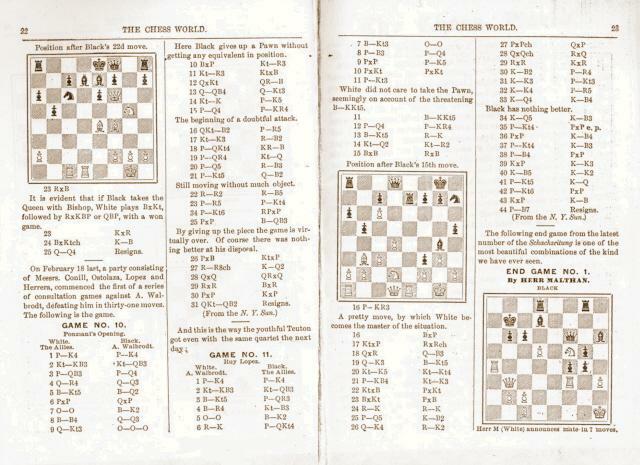 ... A further curiosity in Comparative Chess is that on page 104 it was 7…O-O, rather than 8…d5, that Marshall emphasized. Of 7…O-O he wrote (incorrectly), ‘This move of mine, I claim to be original’. On 13 October 2018 we sent CHESS a brief, purely factual, Letter to the Editor. The magazine decided to publish instead, on page 50 of the November 2018 issue, an apology which, though complimentary, was confused and confusing. Latest update: 3 November 2018.